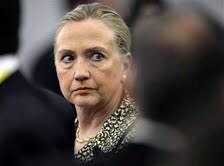 The Benghazi attack that resulted in the deaths of 4 Americans was, with almost 100% certainty, a planned prisoner exchange to swap Ambassador Chris Stevens for "The Blind Sheik." It was, in my opinion, a deal between Barack Obama and Mohamed Morsi that went bad. This story has been floating around since shortly after the attack. The difference between now and 10 months ago is that the original hypothesis has continued to gain evidence to support it. Yesterday's conspiracy has turned in today's reality. This will likely be a long write-up but for the sake of my country I plan to tell you what I know. In the end you will have to judge whether you deem it as proof or at least reason for suspicion to support this story line. Americans are sick and tired of the media circus and the lack of results coming from Congress. We want the truth. The problem is that our congressional leaders don't seem to be asking the right questions and they are certainly not talking to the right people. On Thursday, CNN's Jake Tapper added to the growing evidence of internal cover up by exposing the fact that "dozens" of CIA agents were on the grounds and have been intimidated so they won't talk. They are allegedly going through routine polygraph testing to ensure they are not talking to either the media or congress. I was ecstatic to see that come from a left-wing media source, by the way. The truth is that this is not about left v. right. It is about wrong v. right. Evidence may come out that "the right" was complicit in this cover up, as I believe they are. I believe that we have lots of corrupt legislators on both sides of the aisle that are covering this up like their life depended on it. Because it probably does. For Congress to spend all of this time beating a dead horse makes me think that they are knowingly complicit or, at least, inadvertently complicit in this cover up. They continue to ask "softball" questions of people who they know will be unwilling to talk. Chances are that nearly every past testimony is already a case for perjury but how will we ever know if we don't get to the truth? So what happened? What is this talk of a prisoner exchange? Again, this is going to be a long article because I want to make sure that I leave nothing out. Egypt's President-elect Mohammed Morsi made a nod to his base in a speech on Friday when he pledged to seek the release of Sheik Omar Abdel-Rahman from U.S. custody. 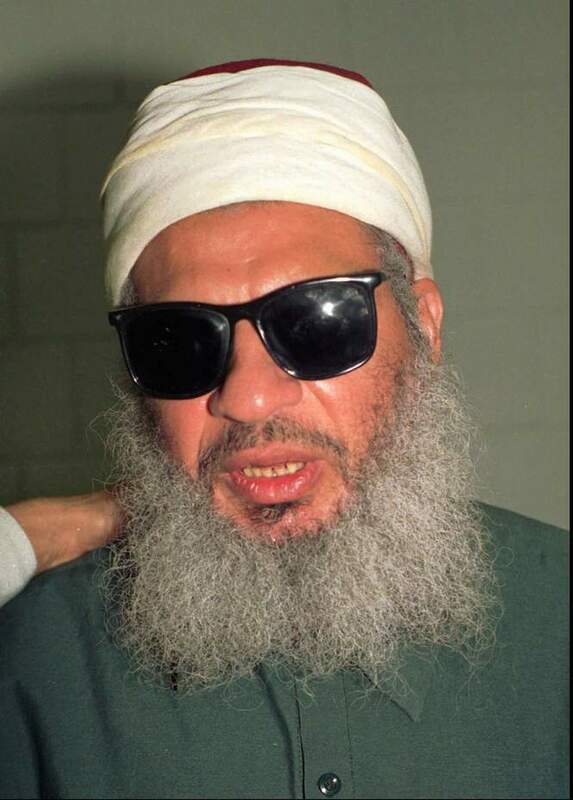 Sheik Abdel-Rahman, who is better known as the "blind sheik" is serving a life sentence at a federal penitentiary in North Carolina for his role in planning the 1993 bombing of the World Trade Center in New York City. This is more than likely where the theory began. What one must ask themselves is this…Did Morsi already have a plan in place to make sure that he could deliver on this promise? It is my belief that he did. Barack Obama was a big Morsi supporter from the beginning as were his cabinet members. Shortly before the current revolution started John Kerry waived normal conditions to make sure that Egypt got 1.3 billion in additional aid from us. When did the Egypt/USA prisoner exchange theory first gain some credibility? The benefit to Morsi is obvious, but what about Obama? What benefit could Obama possibly receive from this exchange? The idea is that, in what was thought to be a hotly contested presidential race, an October release of Ambassador Stevens may have been enough to put Obama over the top. A tragedy happens and Obama rides in on his stallion to save the day… It turns out that he did not need any help. Great theory, but how can we prove anything when no one is talking? The thing is that people are talking, but no one seems to be listening. Witnesses and whistleblowers have been intimidated into silence in our own country but they are talking elsewhere. A lot of smart bloggers and journalists have caught on to this, and even though most of these stories don't make it to the mainstream media, it does not mean they are not true. Now I want to summarize four stories that I feel lend credibility to this prisoner exchange scenario. All of them came from outside of our own borders. To this day I would bet that less than 10% of American people realize that we were paying an Al Qaeda linked group to defend our diplomatic mission in Benghazi. Why would we do that? Well maybe we wanted to make sure that attack happened. The February 17th Martyr's Brigade was hired by our government to defend the diplomatic mission in Benghazi. This organization proudly flew an Al Qaeda flag on their Facebook page. Yes I am serious. Two days before the attack they threatened withdrawal. A few hours after the attack they officially disbanded. How convenient? Does that smell anything like a set up to you? The only way we would have left that diplomatic mission in such bad hands is if we wanted it attacked or simply did not care. Further Research: TREASON…Government Hired Al Qaeda to Defend the Diplomatic Mission in Benghazi? "…according to the March 14 posting on an al Qaeda-linked website, Abdallah Dhu-al-Bajadin, the al Qaeda weapons expert, stated that Stevens was given a lethal injection and that the injection was overlooked during the medical autopsy. According to Dhu-al-Bajadin, "the plan was based on abduction and exchange of high-level prisoners." "Don't shoot, don't shoot, Dr. Morsi sent us." At this point my personal thoughts were starting to lean in the direction of the "prisoner exchange" theory but I was not convinced. I had one Al Qaeda operative and one translator of Arabic in my corner. I don't know Arabic and didn't know that there were other sources citing the same translation. I felt that there was still something missing. Then it happened. At the end of June we heard a third story to corroborate everything and the story was huge, yet very under reported by both the left and right. On Wednesday, June 26, several Arabic websites, including Veto Gate, quoted the intelligence report, which apparently was first leaked to the Kuwaiti paper, Al Ra'i. 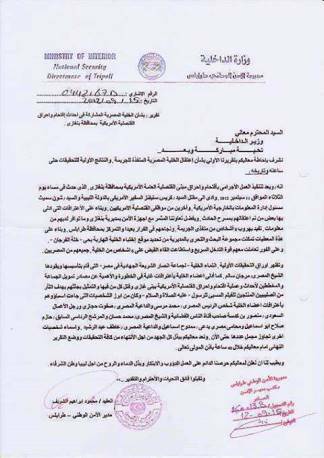 Prepared by Mahmoud Ibrahim Sharif, Director of National Security for Libya, the report is addressed to the nation's Minister of Interior. It discusses the preliminary findings of the investigation, specifically concerning an "Egyptian cell" which was involved in the consulate attack. "Based on confessions derived from some of those arrested at the scene" six people, "all of them Egyptians" from the jihad group Ansar al-Sharia ("Supporters of Islamic Law), were arrested. According to the report, during interrogations, these Egyptian jihadi cell members "confessed to very serious and important information concerning the financial sources of the group and the planners of the event and the storming and burning of the U.S. consulate in Benghazi…. And among the more prominent figures whose names were mentioned by cell members during confessions were: Egyptian President Mohamed Morsi; preacher Safwat Hegazi; Saudi businessman Mansour Kadasa, owner of the satellite station, Al-Nas; Egyptian Sheikh Muhammad Hassan; former presidential candidate, Hazim Salih Abu Isma'il…"
There is a similar translation from a different source in this article at WND.com. So where does this leave us? It would appear that Morsi can be as least listed as a strong suspect. 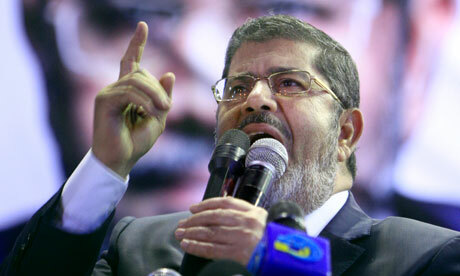 Three sources of proof have come forth to substantiate the story of a prisoner exchange and/or Morsi's involvement. How can we reasonably tie that to Barack Obama and Hillary Clinton? I can't tell you of anything that we have thus far that might hold up in court but just consider the actions of Obama, Kerry and Clinton. How many times have we bent over backward in recent months (before the revolution) to placate Morsi and The Muslim Brotherhood? The 1.3 Billion dollar gift from Kerry and his waiver of congressional restrictions is a perfect example. Anyone hear anything about fighter jets and tanks? Why is this important? It is important because I guarantee that Obama, Clinton and Kerry knew about that Libyan intelligence report long before we ever did. Yet they continued to support our Egyptian "allies" and went out of their way to do so. Why? Because they were partners in crime with Morsi and I am 99% sure of it. If they wanted justice for Morsi's involvement in Benghazi they would have called for it long ago. Rand Paul has been screaming for months about how we need to cut off aid to Egypt and very few of his colleagues seem to listen. Why might that be? It might be that many of them are complicit. They are covering for Obama. When I hear these stupid questions about where Obama was or who gave the stand down order I cannot easily digest them. These questions are irrelevant to the bigger story. It seems to me that our congressional servants are protecting the president and his staff. These people are more informed than you or I. That is their job. Many of them know about these reports. Again, it is their job to stay informed and they have varying levels of security clearance and plenty of contacts. I get very frustrated as a small potatoes blogger. I find these stories and report them and see the media ignore them. This includes a lot of big right-wing news sources. It's not just the liberal led mainstream media outlets. In the end it is my belief that both Hillary Clinton and Barack Obama were involved in a deal to send The Blind Sheik back to Egypt in exchange for Stevens. A few people on the other end screwed up the script and here we are. I am not really concerned with what Obama was doing during the attacks. It's obvious that he was gone to establish distance from the happenings of September 11th 2012. It was planned for his protection. I am more concerned with the fact that Hillary Clinton and Barack Obama are more than likely accessories to the murder of four Americans. That is how I see it. In my mind I already know, with almost 100% certainty, what happened and it is my belief that corruption runs so deep that congress will not do one thing about it. They will continue to ask stupid questions that get us nowhere. Very few of them have any backbone at all and we will continue to see evidence of that in the coming months. So I write this not for any results to come out of it. I am just hoping that some people will find some peace in the truth. If we could get the truth from our own elected officials we wouldn't have to trust Al Qaeda operatives, Egyptian journalists and Libyan intelligence reports. For now that's all we have. If congress would approach this angle then the details might begin to fall into place. Either way, unless something major breaks to prove me wrong, I have heard what I needed to hear in regards to the truth. I know the road that congress should be taking and they are failing to take it. Obama and Clinton certainly deserve their day in court because nothing I have told you is absolute proof, but… My guess is that they will never see that day in court. It's a travesty for the families and for the American people as a whole. But I hope you can walk away from my ramblings today and have a clearer picture in your mind of why this senseless tragedy happened. I have a sense of peace about what happened in Benghazi and I hope you can find the same. All I wanted was the truth. I never really believed our government would do anything about it. We cling to the truth for that is all we have. Yes, our government really is this corrupt. Previous Will You Live & Fight To Restore The Republic? Next Why Would the US Not Go Egypt?